The Fabulous SF Sorrow Record Show every wednesday 45rpm Record Show @ La Mecanique Ondulatoire. Want to know the noisy roots of Sonic Youth, Young'uns? The legacy of which the Black Keys are a part? Do some time travel with SF Sorrow and his guests and you'll be graduating from the academy of Rock-Soul-and-Punk. But then there are plenty of graduates already out there who are used to swinging and swooning every wednesday for this blessed ritual. Tonight, another great Paris dj, Topper Harley, will be sharing the turntables. Note: The great Mecanique Ondulatoire will be closed for New Years. I recommend making a tour of these bars, since these gigs run until dawn!!! Le Baron Samedi, 12 Rue des Goncourts, 75011: If you like the morsel above, then you're in luck because dj SF Sorrow spins New Years Eve (actually at midnight, going all night) at BS with DJ Baldo (another excellent Paris dj who favors garage). The BS is a good mid-sized bar for lovers of soul, blues, and garage. An excellent way to spend your New Years. La Feline, 6 Rue Victor Letalle, 75020. Yours truly le Grand Duc du Kansas (D.I.E.) shares the turntables with the inimitable Pat for an uproariously awesome New Years full of whiskey shots, free kisses, and dancing on the bar! Expect the best of rockabilly, soul, classic punk, hard rock, surf, power pop, and New Wave. Until Dawn!!! Then UPcoming shows in January. Lots of great indie garage acts. Other shows will be added soon. Fri, 15 Jan.: Eli Paperboy Reed and the True Loves: Scopitone Club (5 Ave. de L'Opera). This is not to be missed for diehard fans of classic soul. Vic Chesnutt (November 12, 1964 – December 25, 2009) was a cult indie singer-songwriter, living in Athens, GA. He was rendered paraplegic in a 1983 car accident, but managed to keep making music. Michael Stipe discovered him playing in Athens and quickly produced his first two albums Little (1990) and West of Rome (1991). Chesnutt collaborated with a host of indie talents, ranging from Lambchop and Widespread Panic, to Thee Silver Mt Zion, Godspeed YOu Black Emperor, Cowboy Junkies, Fugazi’s Guy Picciotto, Throwing Muses' Kristen Hersh, and guitarist Bill Frissell. Chesnutt, was known for his weathered, often un-melodic and narrative vocal style, poetic lyrics and lack of rhyme and meter. During his recovery from the car accident he read a great deal of American classic poetry, such as Wallace Stevens and Emily Dickinson, which he claimed inspired a lot of his later songwriting. A documentary video of Chesnutt's life called Speed Racer was produced and directed by Peter Sillen in 1991, and aired on the PBS channel in the U.S. Last fall, Chesnutt spoke about the atrocity of American healthcare, noting that he had $70,000 in medical bills that he couldn't pay, and still he could die any day, unable to get further necessary operations and other care. His feelings about living on that edge, ever suicidal, are immortalized in songs like "Flirted With You [Death] All My Life" (see below). Chesnutt died from a painkiller overdose on friday, Christmas Day. 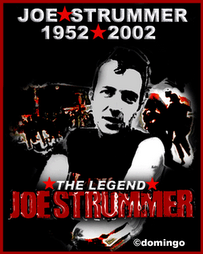 On Twitter, his friend and frequent collaborator Kristin Hersh claimed the death was a suicide. This is probably my favorite song by him. Thanks, Vic. And here is "Flirted With You All My Life"
Fleche D'Or is back open! Hosted the Raveonettes last Saturday, in fact. Le Picolo, 58 Rue Jules Valles, St. Ouen, has also had a lot of great local and international Garage, Punk, Rockabilly. Short walk from Pt. de Clignancourt Metro on the peripherique (see upcoming events at bottom of this post). La Mecanique Ondulatoire should be having concerts again in January. Stay tuned! Kid Congo Powers, Tues, Dec. 15@ la Boule Noire. This is of course the guitarist/singer of bands like the Gun Club and the Cramps. (but I'm sure you'll be next door at the W.A.S.P. concert) ;). Expatriate, Wed., Dec. 16 @ Nouveau Casino: Aussi group compared to Interpol. 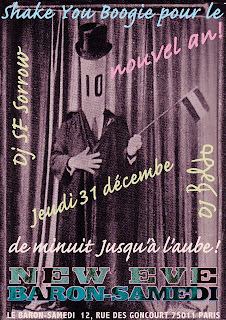 The Fabulous SF Sorrow every wednesday 45rpm Record Show @ La Mecanique Ondulatoire. Want to know the noisy roots of Sonic Youth, Young'uns? The legacy of which the Black Keys are a part? Do some time travel with SF Sorrow and his guests and you'll be graduating from the academy of Rock-Soul-and-Punk. But then there are plenty of graduates already out there who are used to swinging and swooning every wednesday for this blessed ritual. Black Heart Procession, Thur., Dec. 17 @ Mains d'Oeuvres. Slow, dark low-fi indie folk rock a la Will Oldham/Bonnie Prince Billy. Temper Trap, Fri, Dec. 18 @ Nouveau Casino. Aussie indie pop with a good reputation in that genre. New Model Army 18 Dec., Friday @ La Maroquinerie. Post-punk, experimental, indie-folk rock-- they've been called it all. Lots of necessary anti-imperialist (mostly American) material. Emir Kusturica and the No Smoking Orchestra @ Le Zenith, Saturday 19 Dec. Famous film Director Black Cat White Cat, Underground, etc and his wild Balkan music. Marilyn Manson @ Le Zenith! Ever since Bowling for Columbine, I've wanted to see what this guy is all about on stage. Those of you who put down the cash for it, write back and let us know what you thought. Then UPcoming shows in January. Lots of great indie garage acts. The American College Music Journal's rankings this week. The indie supergroup Monsters of Folk featuring Conor Oberst, Mike Mogis, M. Ward and Yim Yames at numero uno in the Independent-only category. In the general category, the Flaming Lips. 1 3 FLAMING LIPS Embryonic Warner Bros.